Whether your client is rich or poor, once you accept the brief , do justice to him by rendering your sincere services. Not only towards your profession but also towards society, you have got a great concern as a lawyer and as a citizen of this country. 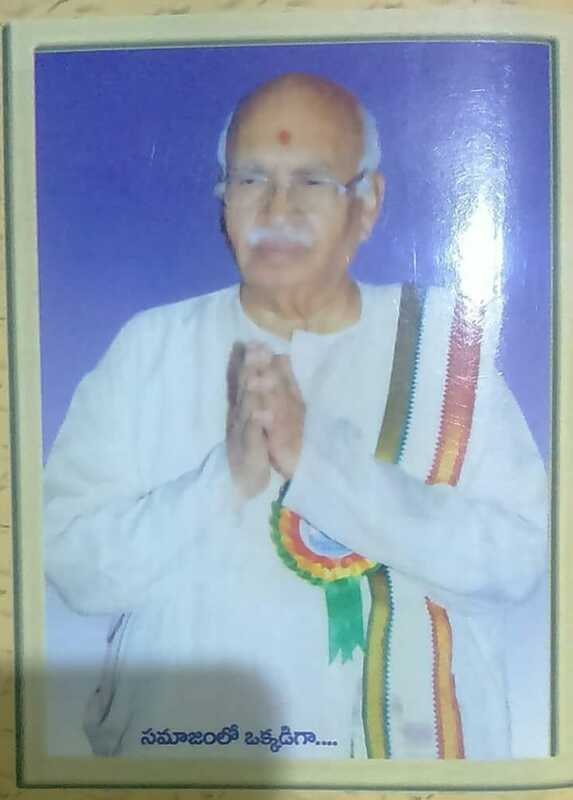 My Godfather, My Guru , My Mentor, My Senior………..a grate legend of legal fraternity and a Great Versatile Personality, silently walked away on 13/09/2018 at Kurnool , leaving behind him his noble thoughts, his abundant blessings on us. May his soul rest in great peace and tranquility . My deepest condolences to my little brothers Dr. Rama Sarma, Jogaiah Sarma , Madhava Sarma and to my little sister. Previous Post whether the Division Bench was right in dismissing the appeals “as not pressed”. = In our opinion, neither there was any express prayer made by the MUDA and nor it could be inferred from the document relied on by the Division Bench at the instance of respondents (writ petitioners) for forming an opinion “not to press the appeal”. In other words, the opinion formed by the High Court for dismissing the appeals “as not pressed” had no basis. Such dismissal, in our view, certainly deprived the MUDA of their right to prosecute the appeals on merits. Next Post Consumer Case – MEDICAL NEGLIGENCE – no medical evidence of any expert was adduced = In our opinion, there has to be a direct nexus with these two factors to sue a doctor for his negligence. Suffering of ailment by the patient after surgery is one thing. It may be due to myriad reasons known in medical jurisprudence. Whereas suffering of any such ailment as a result of improper performance of the surgery and that too with the degree of negligence on the part of Doctor is another thing. To prove the case of negligence of a doctor, the medical evidence of experts in field to prove the latter is required. Simply proving the former is not sufficient. = not able to prove that the ailments which she suffered after she returned home from the Hospital on 08.08.1996 were as a result of faulty surgery performed by the appellant. = It is apt to remember the words of the then Chief Justice of India when he said in Jacob Mathew’s case (supra) which reads as under: “The subject of negligence in the context of medical profession necessarily calls for treatment with a difference. There is a marked tendency to look for a human actor to blame for an untoward event, a tendency that is closely linked with a desire to punish. Things have gone wrong and therefore somebody must be found to answer for it. An empirical study reveals that background to a mishap is frequently far more complex than may generally be assumed. It can be demonstrated that actual blame for the outcome has to be attributed with great caution. For a medical accident or failure, the responsibility may lie with the medical practitioner, and equally it may not. The inadequacies of the system, the specific circumstances of the case, the nature of human psychology itself and sheer chance may have combined to produce a result in which the doctor’s contribution is either relatively or completely blameless. The human body and its working is nothing less than a highly complex machine. Coupled with the complexities of medical science, the scope for misimpressions, misgivings and misplaced allegations against eh operator i.e. the doctor, cannot be ruled out. One may have notions of best or ideal practice which are different from the reality of how medical practice is carried on or how the doctor functions in real life. The factors of pressing need and limited resources cannot be ruled out from consideration. Dealing with a case of medical negligence needs a deeper understanding of the practical side of medicine. The purpose of holding a professional liable for his act or omission, if negligent, is to make life safer and to eliminate the possibility of recurrence of negligence in future. The human body and medical science, both are too complex to be easily understood. To hold in favour of existence of negligence, associated with the action or inaction of a medical professional, requires an in­depth understanding of the working of a professional as also the nature of the job and of errors committed by chance, which do not necessarily involve the element of culpability.”= the appeal succeeds and is accordingly allowed. The impugned order is set aside and that of the order passed by the State Commission is restored.